Burners make their way down a human slalom during a previous Burner Ski Day. 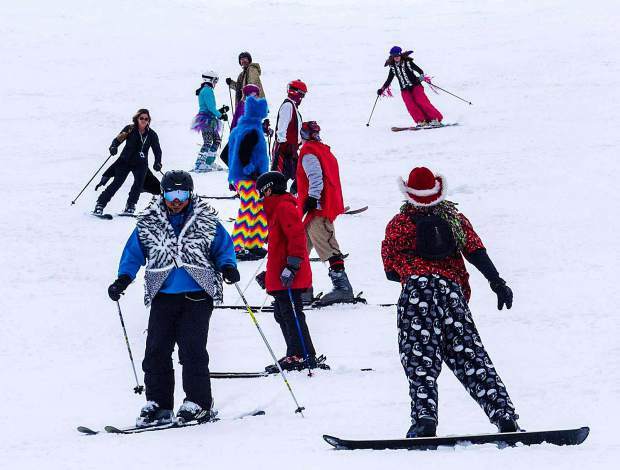 Everyone is invited to dress wacky and join in the family friendly fun Saturday, March 31, at the 5th annual Burner Ski Day for Burners and “Burner Curious.” Everybody will hit Sierra-at-Tahoe’s plaza and slopes in their “playa finest” costumes. Free slopeside “playa on the plaza” includes Burner Bike Parade (bring your bike), Playa Finest Fashion Show, art, performance, music, and dancing. There may even be some “mutant vehicles” roaming the parking lots. There are no open flames allowed. “Remember that ‘you are the show,’ so show off your art, your performance, your bike and your mutant vehicle,” said a press release from the Tahoe Burners. Beginners to experts can join in the mountainside fun, including “Human Slaloms“ and “Burner Mass Descents.” Discount lift tickets are available on site for those dressed in their best “playa wear” and cost even less with your season pass from another resort. The event starts at 9 a.m. and ends at 3 p.m. The forecast is calling for sunny conditions and warm temperatures. Look for the Tahoe Burner flags by the fire pits on the main slopeside plaza. For more information, visit the event page at http://www.facebook.com/tahoeburners or http://www.tahoe@burningman.org.